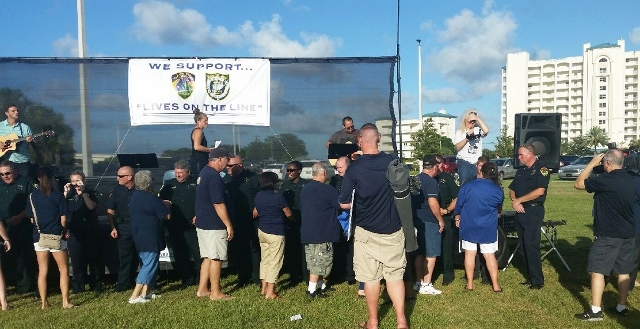 TITUSVILLE, Florida - Hundreds of residents from North Brevard County attended at a rally to support their local law enforcement officers Sunday night. 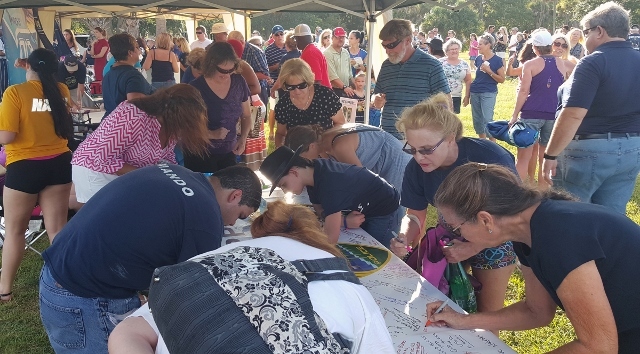 The event, sponsored by the The Church is One in North Brevard Pastor's Prayer Group, was an opportunity for the community to come together to express their appreciation for the strong, longstanding partnership between law enforcement in North Brevard and its citizens. Several local pastors lead the crowd in prayer for the community, focusing on everyone continuing to work together during the recent violent events that have unfolded across the United States. "Words cannot express how much this turnout means to the men and woman of our department," said Titusville Police Chief John Lau who praised the outstanding teamwork in the North Brevard Community. "The support we get from our Citizens, City Council, and our City Manager is second to none." The crowd, estimated to be at several hundred, wore t-shirts with Titusville Police Department and Brevard County Sheriff's Office patches. Members of the Titusville Fire & Emergency Services were also present to show support at the event. The show of support to local law enforcement was in stark contrast to some of the anti-police protests that have been covered on national news outlets recently.